I recently realised that sometimes when we watch a sunrise or a sunset we are actually watching a mirage! Wow! It’s natures biggest optical illusion! Light from the Sun is bent, or refracted, as it enters earth’s atmosphere. This effect causes the apparent sunrise to be earlier than the actual sunrise. Similarly, apparent sunset occurs slightly later than actual sunset. Isn’t that pawesome?! So what we think is the sun is actually just trickery! Mother Nature really is a magician! The refracted light leaves the lovely red hue as the sun sets. I especially love the colour of the water when the sun rises and sets, the beautiful rays of light make the ocean look magical. When the humans take a photo of me in this light it also makes my eyes flash red! Spooky! You’re eyes match the mirage! Wooooowoooooo! Such a beautiful sky and water! You are also very enjoyable to look at, Bailey. Great shot Bailey! But most of all I agree about mother nature’s magical mirage called sunrise and sunset……..it always reminds me of how lucky I am to either have one more day to look forward to – or be grateful that the day I just spent was given to me – either way – it’s all just one more day. I hope you enjoy MANY MANY more beautiful mirages from the deck of Nocturne my friend. That is something that my human didn’t know! She is kind of mad that Mother Nature is playing tricks on her, MOL! It may br a mirage but it is glorious on the eyes! Those are some great lasers, Bailey! Like two sunsets on your face. How often we don’t really see what we think we’re seeing! Can you repeat that effect at night? It’d be a wow for Halloween! Bailey that is the most interesting info! I never knew that! Wow the water looks… well, magical!! Yeowzer!!! 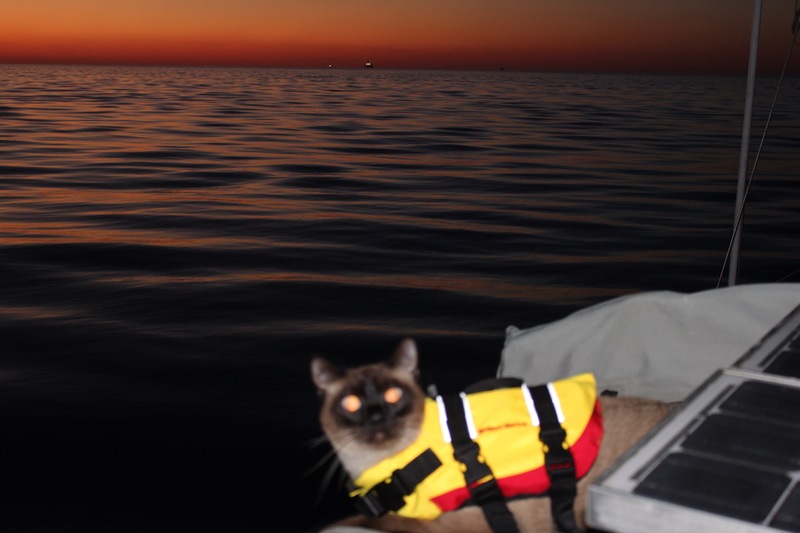 A laser eyed meezer in a life jacket!!!! Other worldly! !